I’ll also explain why I think this particular version of the car is the best one you can buy if you’re in the market for a used Model S (and maybe even if you’re considering a new one.) Finally, I’ll briefly discuss the weird process of buying a used Tesla from Tesla. My original car was built in May of 2016. This car was built in December of 2016—I was looking for one built between October and December, for reasons I’ll discuss below. I “gained” 13,000 miles by replacing my car—the old one was over 34,000 miles, the new one is under 21,000. While I didn’t hate the old design, the new one is much cleaner to my eye. But that really had nothing to do with why I bought the car. My original car had a full glass roof with sunroof while this one has a panoramic roof (no cross-supports between windshield and rear hatch). I wanted the sunroof, but could not find a car that offered it (and met all my other criteria). My old car was very near the end of its three-year 36,000 mile warranty. The new used car, because I bought it directly from Tesla, is covered by a four-year 50,000 mile warranty. This was a fairly important reason for trading cars, as I wanted some additional warranty protection. And yes, the used car I bought has a longer warranty than the new car I bought. Weird. The new car has Tesla’s Autopilot 2 hardware, featuring eight cameras instead of my original car’s one. It also includes the Full Self Driving capability, an optional feature at the time of purchase. More on this below. 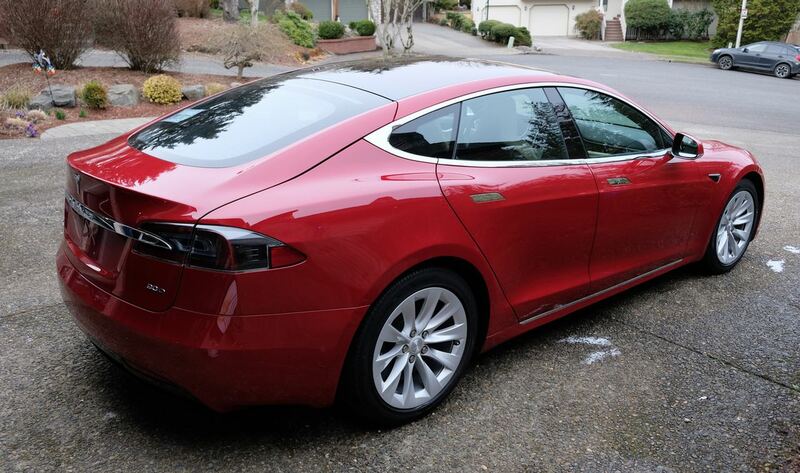 So much for the specs…what is it about this particular Model S that makes it The Unicorn Car? My wife coined the term Unicorn Car after I’d been searching Tesla’s used car site for months; she decided I’d probably have as much luck searching for unicorns as I was having searching for this car, hence the name. So what makes it the Unicorn Car? It’s the combination of three features: Unlimited free use of Tesla’s Supercharger network, the second-generation Autopilot hardware, and the autopilot hardware having the Full Self Driving feature (an added cost item) purchased by the original owner. Unlimited free SuperchargingFree Supercharging is a feature of the car, not a benefit to the original owner. So when the car sells, the free Supercharging goes with it. is only available on cars built before year-end 2016, and second-generation Autopilot hardware—though announced in August of 2016—seemed to hit volume production in October of 2016. (The new front-end design started in June-ish of 2016, as I recall.) Hence the desired production window of October to December, 2016. The second-generation autopilot hardware, with its increased camera count, was one of the main things I was after in this upgrade—this matches what Tesla is still building today in the Model S, so this car is relatively “future proof” in terms of its autopilot features. Keeping Tesla’s tendency to continuously innovate, Musk later stated that HW3 would be equipped in all new production cars in around 6 months. Transitioning to the new hardware will not change any of the vehicle’s sensors or production, either, as it is simply a replacement of the Autopilot computer being installed on all vehicles today. As an added note, Musk pointed out that Tesla owners who purchased Full Self-Driving would be given the HW3 upgrade free of charge. Owners who have not ordered Full Self-Driving, on the other hand, would likely pay around $5,000 for the FSD suite and the new hardware. As you might expect, these cars are rare—there aren’t a lot of Model S cars to begin with, and narrowing it to a three-month production window further narrows the field. Even if made within that window, not every buyer opted to pay for the full self driving capability (or even the new autopilot hardware). And then there’s the fact that I hate black interiors, which further narrows the list of available cars. Finally, I wanted to match the set of options on my existing car as best as possible, as I’d gotten very used to having them around. In short, I was definitely searching for a unicorn. When I started my search, Tesla’s used car search was very limited: It could only search within one region at a time. I saved bookmarks to search each of their locations, and checked each day for matching cars in each region. Day after day, I’d search and come up with no matches. Or matches only for the very-expensive P100D. Or matches that had black interiors. Or that were missing key features. Or that had everything but the full self driving capability. Since the beginning of 2017, Tesla has greatly simplified the Model S ordering process—things that were options on my cars are now standard features. But they’ve also removed things, such as the sunroof and my preferred light-tan-colored interior. Combine the reduced feature set with the free Supercharging and new autopilot hardware (plus a soon-to-arrive new autopilot computer), and that’s why I think the October to December 2016 Model S is the ideal used Model S if you’re in the market. Buying a used Tesla is unlike buying any used car I’ve ever bought in the past. It’s probably most similar to buying one from Carvana, which I’ve never used. Once you find the car on Tesla’s site, you click a button to request photos. Once the photos arrive, you look them over, looking for flaws and making sure what was described on the site is what you see in the photos. There’s no way to test drive the cars, nor see them in person before purchasing. That’s…weird…for cars in this price bracket. Thankfully, the car was in excellent condition—one reason I bought a used Tesla from Tesla instead of a private owner was the warranty, and knowing that Tesla wouldn’t offer that before they went through the car to make sure everything was fine. Still, buying a car sight-unseen is a new experience for me, and I’ll admit it’s far from comfortable. But we’re very happy with the new used Tesla—we’ve named this one Needle, given the trouble we had finding it in the haystack of used Teslas. That was a lot of words about one car (OK, technically about two cars). Hopefully you found some nuggets of useful information on Teslas or electric cars in general. I really do think we’re headed to a mostly-electric automotive future, and I think that’s a good thing. If you have any questions about Tesla’s cars or this series of articles, please post them here, or contact me via Twitter or email (my first name at my domain) and I’ll do my best to answer them. Thanks for reading! Fabulous series…. thanks so much, Rob! I’m saving up for a Tesla. I bought a 2016 Mitsubishi i-MiEV in 2017 (it had been on the lot for nearly a year). The $7500 tax credit amounted to nearly a third of the price. I had a 50-amp Level 2 home charging station installed in my garage and bought a JuiceBox charging center. The i-MiEV can only use 16 amps, but I figured if I’m going that far, I might as well aim for adding value to the home. I love the i-MiEV but with a 62-mile range and having been discontinued in this market, it’s not exactly a unicorn, more like a 5-leaf clover. Anyway, it still beat the pants off the Leaf I test drove, AFAIC.